Insights: Pool, Gym, Ideal for business travelers, couples or the lone traveler. Suits Us is nothing but elegance. This Kingston Jamaican vacation home is modern and tropical inspired designed, two bedroom vacation rental. This gated community has has a communal pool and is guarded 24/7. This short stay home is located only three minute drive from New Kingston, Kingston Jamaica’s business and entertainment district. Welcome to a different kind of Jamaican vacation. Stay in your own luxury Kingston apartment rental and experience a holiday like never before. Airy and new, this apartment successfully combines modern amenities, and contemporary luxury with tropical charm and beauty. Located in a brand new well-maintained and well-secured residential city apartment complex, this vacation rental suite has all the comfort to suit your vacation needs. After entering the gates to this magnificent apartment complex, your Kingston city vacation rental has a bright entryway, large living room connected to the dining room, air conditioning in bedrooms, hot water throughout, fully equipped kitchen, master bedroom with a king bed and a bathroom (with wall mounted shower) and a second bedroom with two queen bed and a second bathroom. Everything in the apartment has been thoughtfully chosen and arranged with care in order to ensure your comfort. Soak in either one of the bathrooms with luxurious tub or shower, wrap yourself in a thick white towel and relax after a day of sightseeing in Jamaica or business meeting. 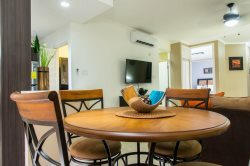 The apartment has been equipped with high speed wireless Internet, flat-screen cable TV, cozy sofas and chairs, and all of the comforts you will need to feel at home in Jamaica. At this apartment rental you are automatically greeted with a unique and welcoming feel. This holiday flat upholds the high standards of maintenance and cleanliness found in every Prohomesja apartment and provides all the comforts of home. • Fully-equipped kitchen with cooking utensils, dishes, refrigerator, stove, oven, microwave, and everything you might need to cook at home like a true Jamaican. • Master bedroom with king-size bed and flat screen cable TV (sleeps 2). • Patio with view of the beautiful surroundings and well-kept landscaping of the complex. You will be met at the apartment by one of our excellent customer-friendly staff who will settle you in and answer all questions about Jamaica and your vacation rental. They will be available to call if you have any questions during your stay. At Prohomesja in Jamaica we want your vacation to be one you will never forget. Located within 5-10 minutes walking distance from: Restaurants & Bars, parks, cinemas, Supermarkets, Gym, Embassies, Shopping Mall, Business Centers, Night Clubs, Hospitals, Police Stations and Fire Stations, . This vacation apartment is conveniently located in the heart of Kingston, ideal corporate housing for the business travelers and for those adventurous island hoppers. Make your visit to Jamaica an unforgettable one by booking this fabulous city vacation rental! You're in for a treat as this two bedroom vacation condo is managed by prohomesja, so book this fabulous vacation home and be assured that you booked your holiday with someone that takes your enjoyment as seriously as you do. Please note that check in is at 4:00pm and checkout is at 11:00am. If for any reason you are unable to make these times then please contact us to make alternative arrangements.